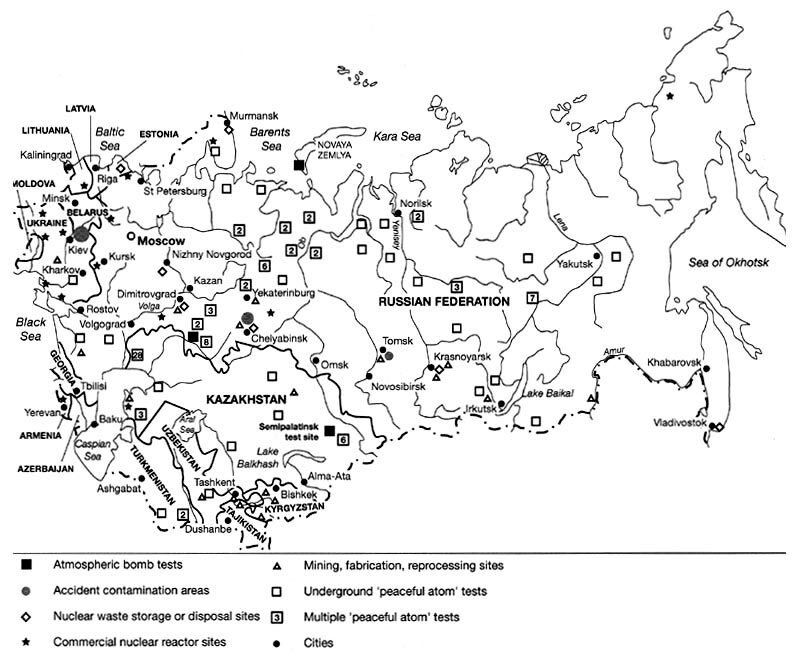 The third major area of contamination in the former Soviet republics, and certainly the most contaminated portion of Central Asia, is around the nuclear weapons test site in Kazakhstan (Figure 19.1). This testing range covered some 18 000 square km at a location about 200 km west of the city of Semey (formerly Semipalatinsk). A total of 467 nuclear blasts were carried out here, including atmospheric explosions from 1949 to 1963. The test site was closed by the newly independent Kazakhstan government in 1991. There is extensive surface radioactive contamination at, and around, the Semipalatinsk test site. Twenty-four of the above ground tests there resulted in radioactive contamination being deposited far beyond the boundaries of the test site (Bradley, 1997). Measurements of caesium-137 in the soil at the detonation craters showed concentrations similar to Chernobyl after the 1986 accident. A special commission found that 10 000 of the 70 000 local residents had received elevated radiation doses from the tests, primarily during the pre-1963 atmospheric testing period. Reportedly, 900 residents of the village of Dolon received extreme doses of up to 160 rem (Nucleonics Week, 7 November 1991). The contaminated area extends well beyond the boundaries of the test site. On twenty-two occasions, nuclear tests produced measurable fallout over Russia's adjacent Altay territory. Over a million people still live in contaminated areas. Additionally, from 1961 to 1969, 'about 38 000 curies of radioactive strontium and almost 50 000 curies of caesium were introduced into the Irtysh river' (Bradley, 1997). The Semipalatinsk testing region was examined by an IAEA team in 1994, and most of the area was considered as posing no health risk at that time to local populations. Two portions of the range still require controlled access, however, and a total of 720 km2 are 'too contaminated for human use' (Bradley, 1997).